How the know if a laptop is good for VR? The CPU is the most important part of any computer, acting as the brain of the machine. Depending on how fast the processor runs, the performance of all programs running on the machine will be affected. In the case of VR, it’s incredibly important for virtual reality games to run smoothly. HTC Vive is the current industry leader in VR hardware, and their system requirement is an Intel Core i5-4590 or an AMD FX 8350. For PC, that’s a rough equivalent of i7-6700HQ. Without a decent processor, glitches and crashes are sure to occur, which will cause immersion-breaking moments at best and physical illness, such as motion sickness and headaches, at worse. These CPUs have been reviewed based on whether they meet the minimum requirements for running VR software, as they all contain Intel Core i7 CPUs. In particular, I’ve drawn the line starting with i7-6700HQ and going up from there – considering laptops with 7700HQ, 7820HK etc. 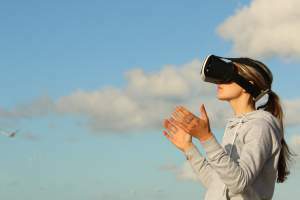 With VR gaming, the graphical processing ability required to deliver a quality experience are significantly higher than simply gaming on a monitor. The level of screen resolution is exponentially higher, framerates need to be rock-solid to prevent nausea, and a number of objects on screen at one time is much larger as well. Because of this, the best laptops for virtual reality need to have powerful dedicated graphics cards installed, with lots of dedicated RAM. The base PC requirements of gaming on an HTC Vive are either an Nvidia GTX970 or an AMD R9 290. In laptop hardware, that’s roughly GTX 1060. When determining a good graphics card for VR, I’ve judged them based on their benchmarks and memory in a given setup. Since these laptops contain fairly powerful internal components, they will inevitably generate a great deal of heat. A little bit of heat is not a problem, but too much heat can cause serious damage to very expensive, delicate parts. Proper heatsinks and the strategic placement of cooling fans are required to keep these laptops running smoothly, so I’ve judged this criterion based on the base running temperature during stress tests. This information can once in a while be found by checking stats posted by the manufacturer, but more often it’s best to check 3rd party reviews for a more objective measurement. Laptops are meant to be mobile. Part of this means being able to run without being plugged into an outlet the entire time. Gaming with VR takes up a great deal of power, so gaming time on battery isn’t very long. Between having a powerful graphics card and a long battery life, the graphics card is infinitely more important for VR. However, it is still important for laptops in general to have a decent battery; without it, it would defeat the purpose of having a laptop entirely. Realistically, a laptop can expect to have about one hour of VR battery life for every three hours of standard use battery life. For this reason, three hours of battery is the bare minimum for gaming laptops to run VR, with anything more being better. The best thing about this laptop is its processor. With 4 cores, 8 threads, and a maximum clock speed of almost 4 GHz and it will tear through any VR game you throw at it. The dedicated GTX 1060 graphics card is fairly impressive: scoring an 8.8 on the SteamVR benchmark test, it’ll run games smoothly, just not at the highest settings. The Cooler Boost technology incorporates 6 heat pipes to vent excess heat from this machine, which is pretty impressive considering it weighs under 5 pounds and can easily fit in a standard laptop bag. Battery life is very disappointing, clocking in at 2 to 3 hours. All in all, this is a decent entry-level VR laptop, but there are definitely better on the market if you’re willing to pay more. This is a step up from the previous laptop on this list, with a few features that provide a better experience. While the processor is the same, the virtual RAM on the graphics card is doubled, allowing for more graphical fidelity when playing. It’s about a pound heavier as well, although still able to transport without too much difficulty. The included MSI SHIFT technology allows for you to switch between different profiles in order to effectively manage heat, although the fans can get pretty loud during graphics-intensive game sessions. Another issue that will inevitably arise is the battery, which hasn’t been noticeably improved over the previous model. Still, tweak a few settings and keep an outlet close by and you’ll have a decent VR machine. The processor in this laptop is a slightly less powerful model. However, the GTX 1060 will handle the majority of the graphics processing, so this won’t affect your gaming at all. Asus has also included the ROG Gaming Center, allowing you to fine-tune your experience for the optimal immersive VR experience. It also incorporates copper pipes for cooling, decreasing a number of fans needed to manage the heat generated from gaming. All of this is contained in a package less than an inch thick, weighing less than five pounds, so portability is no issue at all. With around 4 hours of battery life, this isn’t a massive leap in power from the other models, but it’s better put together and has some extra memory and storage. The main draw for this machine is definitely its presentation. Incredibly sleek and smooth, it weighs just a tiny bit over 4 pounds and is an easy fit in an ordinary backpack. This is impressive due to it containing the same amount of processing and graphics power as other VR laptops, as well as a great deal more RAM and storage space. However, what’s probably the most impressive aspect of the Razer Blade comes with a 6-hour battery life, blowing other machines out of the water. The unfortunate downside to all of this fitting in a form-factor shell is heat management: you’ll definitely want to invest in a cooling pad if you want to use this laptop for extended gaming sessions. That issue aside, this is one of the best gaming laptops on the market, for VR or standard 2D gaming. This is the cream of the crop. In addition to a powerful i7-6700HQ processor, it has a GTX 1070 graphics card with 8 GB of memory, This means it crushes the system requirements of any VR game currently on the market, allowing you to push the settings higher and increase the overall quality without sacrificing frame rate. The heat management in this laptop is also top-notch, maintaining safe temperatures even while gaming in 4K. The battery life is less than stellar, just shy of four hours. In addition to a much larger screen and weighing over 6 pounds, this isn’t a very portable machine. However, the pure technical might of this laptop sets it above the others on the market, making it hands down the best laptop for virtual reality. There are some features in these laptops that aren’t related to their ability to run VR. For example, the picks lower on the list don’t have as much memory or storage space as you may want. However, these can be upgraded for a reasonable price, and they simply aren’t what matter when looking for a good VR gaming laptop. At the end of the day, all you need is a good processor, a good graphics card, and heat management good enough to keep it from burning a hole in your table. These machines all accomplish that beautifully, with a few caveats making some models better for specific customers than others. Hopefully, you found this guide helpful, and I hope you enjoy the next stage in gaming’s evolution!